Too much spice, too much sugar, too little interest. The name is almost Dickensian in its imagery. Professor Cornelius Ampleforth could be straight out of the Pickwick Papers…you know, some chubby, benevolent older fellow in half-specs and a faded waistcoat, with rather limited mental capacity, down on his heels, but possessing a good heart. Whatever – the name evokes a certain good humour and indulgence from us, and at the very least is evocative. That, unfortunately, doesn’t make the Professor’s Rumbullion a rum worth drinking, unless you are into spiced rums and like to have that in your drink (which I’m not and I don’t, so be aware of my personal preferences in this review). Whether there really is a Professor Cornelius Ampleforth is subject to intense and spirited debate by all the same people who can tell you the middle name of the runner up of the 1959 Tiddlywinks Championship in Patagonia. 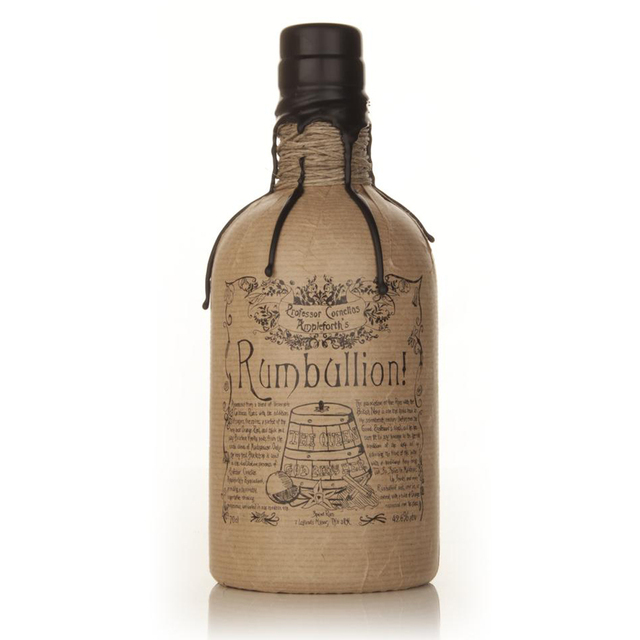 The UK company which releases the Rumbullion is called Atom Supplies and under its umbrella of e-commerce and business consultancy, also runs the online shop Master of Malt, and the brand is their independent bottling operation. They certainly have a sense of humour, as evinced not only by the Professor’s name, but the “Bathtub Gin” they also sell. Bottled at 42.6% and darkly coloured within an inch of the Kraken, what we had here was a rum that assaulted the nose immediately with enormous and instant nutmeg, vanilla and cinnamon notes, caramel and toffee and chocolate, all of which rushed and jostled and ran heedlessly together like a mob entering a Black Friday sale where everything is 90% off. It was also rather thick and almost chewy, and while back in 2010 I appreciated the Captain Morgan Private Stock for precisely those reasons (no longer, mind you), here it was simply excessive, and there was no order to any of it, no gradual progression from one series of well-blended, coherent smells to another…and that made the whole experience something of a disorganized mess. And by the time I got around to tasting it, those spices really became too much, which led to flagging interest, waning ardour and a lot of grumbling and head shaking. So there was cardamom, cinnamon, nutmeg and sweet dark chocolate – these were somewhat better behaved now – to which, with some water, were added scents of cloves, marzipan (I liked that) and candied oranges, at which point the party was over and I was blatted into near catatonia by just wave upon wave of cloying sweetness (quick Prof, pass the insulin!). So yeah, there were additional elements of taste that weren’t bad, just so strong and so much that it was like having seven incidences of coitus in one night – one wakes up the next morning with an utterly blank brain and no desire to do anything meaningful. Even the warm, short fade exhibited this oversweet sense of warm syrup, without adding any new notes – there was the incessant hammer of cinnamon, caramel, vanilla, and to me it was just overkill. To its credit, as I don’t hide my preferences, the makers don’t hide anything either: it is a spiced rum, it’s trumpeted as such, and they’re proud of it. But as always, it’s mostly marketing that one gets when one checks: a secret recipe (hate those), fancy wrapping and no information on components or ageing, if any. I guess for less than thirty quid we shouldn’t be asking for more. This rum is squarely aimed at the casual imbibers who just want a tasty, tarted up, adulterated drink with a little bit of oomph and no hassle, and so although I acknowledge that spiced rums sell briskly for precisely those reasons, they really aren’t my tot of grog. 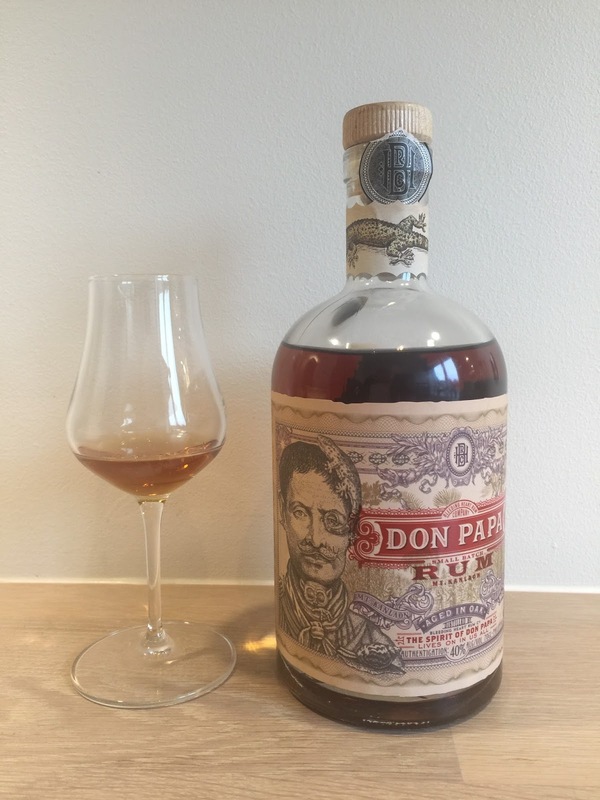 For the record, I disapprove of an online shop not disclosing in its listings that it is itself the maker of a rum whose tasting notes (by its own staff) are rabidly enthusiastic. The RumShopBoy posted a truly funny and apropos review of this and the Navy Strength variation, and despised the ground it walked on…largely due to measured 43g/L of additives. Few “rums” scare me like the Stroh 80 does. It’s like a Tuzemak on steroids, with much of the same obscurely vegetal and spiced choice of flavour profile, boosted by the resident blast bunny to a massive 160 proof that’s as comfortable on the nose and tongue as a prostate exam given by Captain Hook. Stroh’s drone-delivered plastique of an overproof has always has been, to me, as self-aggrandizing as the suicide wings served with waivers I have to sign at my local bar. It is an absurdly large proof driving a rum that is to sophisticated tippling as a sledgehammer is to stone-carving — a tool way too crude to do anything more than destroy everything in its path. It fails as a sipping rum of course, entirely because of its strength (even though that’s is how I had to try it). In fact, some argue it fails as a rum period, because it’s not made directly from sugar cane juice or molasses. Mixing this rum is not only recommended, but encouraged, because if you have it by itself, it’s a bit like choosing a triple espresso instead of a single latte. It makes your drink just a shade … savage. The Stroh 80 is a spiced, unaged spirit and not a spiced, aged rum – therein lies something of my disdain for it as a rum. One could reasonably ask what’s the difference, my response being that a rum is not made from sugar beets (as Stroh is reputed to be), is aged (even if only for a year), and Stroh’s lacks anything of the character all rums possess. I mean, observe the nose – after the initial blast of characteristic overproof plastique and plasticine and rubberized fumes dissipate and you recover some of your sanity (and find your nose again), what you’ll get is not caramel or burnt sugar or anything remotely resembling what you may be used to – but cinnamon, root beer, ginger and christmas cake spices, wrapped up in a hellacious burn. And on the palate, it’s so strong it’s like getting a tattoo done on your tongue with a rusty set of needles by a guy who’s already high on this stuff. Your tongue will numb and turn into pterodactyl hide on the spot and your throat will feel it’s been savaged by a velociraptor. Sure you’ll get strong, amazingly intense sensations of black tea, ginger snaps, Tanti Merle’s christmas spices, some dried fruit (raisins and cherries for the most part), and a blast of cinnamon off the scale. It’s also oddly buttery, creamy, which is kind of interesting, and unusual. You may enjoy this. But at end, the titanic nature of the drink just overwhelms: as I also noted in the SMWS Longpond 9 year old, 160 proof is simply excessive and serves no sane purpose beyond bragging rights (though the Sunset Very Strong 84.5% seemed to have found a way to work around that). The finish is about all I find truly epic, because, like with all overproofs, it’s the gift that keeps on giving, and is surprisingly pain free (perhaps because I had already completed my writhing pain dance and had nothing left to scream about) – it’s heated and so long that one sip did me for ages. I kept thinking I’d been pilfering Santa’s cookies an hour later. 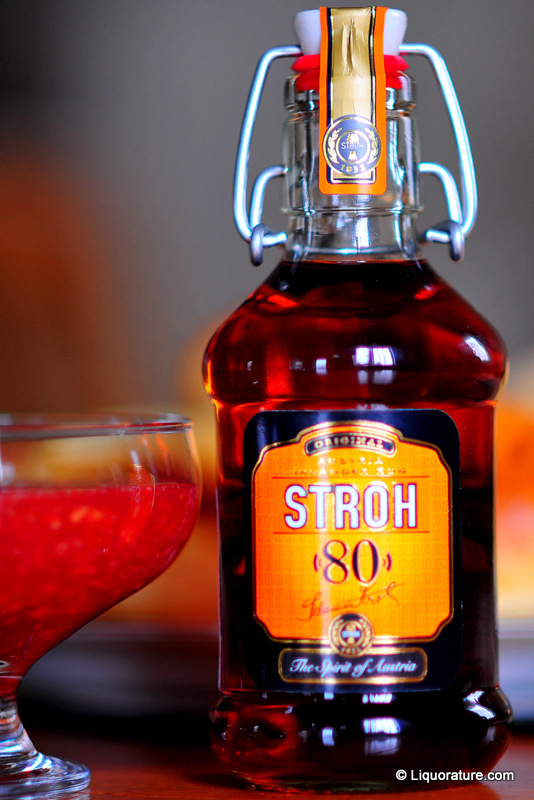 Stroh is an Austrian spirit, made by the Klagenfurt company since 1832, and available in variations ranging from 38% through to 80%. It was probably made from sugar beets deriving from an ethanol base to which spices were added because Austria-Hungary had no tropical colonies of its own to provide the raw stock. I’ve read that currently they use sugar-cane derived ethanol, yet when I was doing the Stroh 54 review some time back, I was advised by a reader that it’s still sugar beet based, so there may be some clarification required here. In any event, Stroh is sold as such and meant primarily as a cocktail ingredient to make Flaming B-52s, jagertee, traditional Austrian pastries, and other strong punches where some oomph is required. And of course, it’s great for chest puffing exercises by all Austrians. The great thing about rums is that there is a real lack of agreed-upon international standards and classifications, and so just about anyone can make something from molasses or sugar cane or what have you, call it a rum, and who is to say different? The really bad thing about rums is that there is a real lack of agreed-upon international standards and classifications, and so just about anyone can make something from molasses, sugar cane and what have you, call it a rum, and who is to say different? That’s part of the problem with the 80, which is so far off the scale that all the unprepared can do is shudder, retch yesterday’s breakfast onto the dog, and reach for the Doorly’s. Stroh’s – probably feeling they wanted to take the crown of the overproofs – distilled a drink for the Junkers class as a test for their manhood, meant to render any besoffner comatose on the spot. What do I think on balance? Well, I sure wouldn’t drink this sucker neat for anything except to write this review: it could be weaponized with too little additional effort. On the other hand, I do like that creamy, spiced up profile for its uniqueness, yes; and the finish is biblical. And to be fair, Stroh’s is quite clear that they don’t make this as a sipping, er, rum. But if you’re feeling like you need to impress the fraulein over in the ecke, and try drinking it that way, be warned: Stroh 80 really does dislike you, does not want to be taken solo, and it will hurt you. My recommendation is simply to leave it in the punch bowl for which it was made, and not risk damage to your liver by guzzling it on its own. This review first appeared in two parts on the Rum Connection website, here. It is reposted here with minor corrections and amendments. It’s a bit of a rant, I’m afraid, and somewhat overlong…it speaks to my disappointment in what has been touted as an ultra-premium, but isn’t. I enjoy the Pyrat’s XO rum about as much as I do the leisurely explorations of my favourite proctologist: the thing is a perennial dust-gatherer on my shelf, and I finally traded it away to the Arctic Wolf in Edmonton. And when one considers the abysmal regard I have for its enormous tangerine nose, one could reasonably ask what business I had shelling out four times as much to buy the brand’s top-end product, the Cask 1623. Truth is, it was like a splinter lodged in my mind for over a year, and no matter how many times I passed it squatting smugly there behind a glass case, I could never get rid of the impression it was sneering at me and calling me a puling, whining cheapskate. So the other day when I had some disposable income, I finally said to hell with it, and got ‘er. 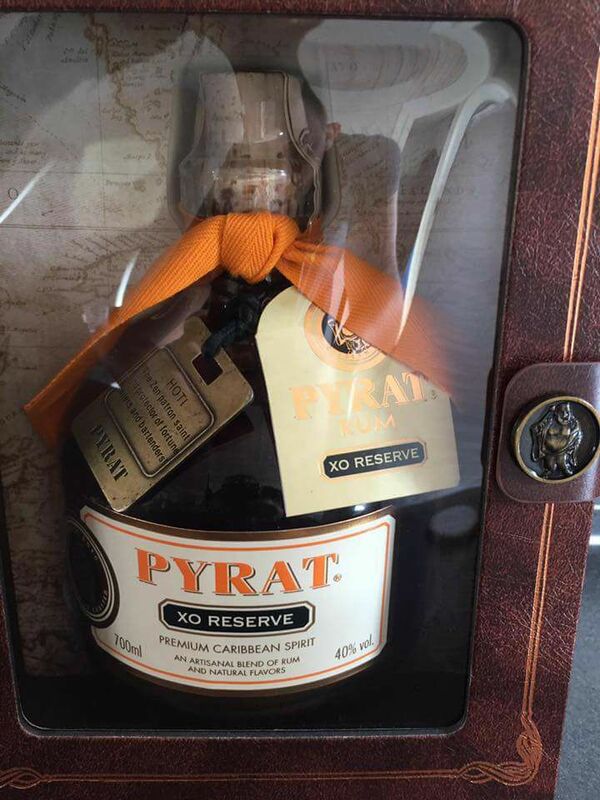 Pyrat’s is a product of the Anguilla Rums company. This is an establishment with its own origin story (whether true or not, it’s still fun reading) regarding a travelling seaman called CJ Planter who fell in love with an island girl who may have been the illegitimate daughter of a plantation owner and a local lady who dabbled in witchcraft. CJ eventually began a rum-making concern which, it must be emphasized, did not create rums from scratch, but blended rums from elsewhere (which continues today – I imagine this is because Anguilla, a beautiful but tiny speck in the Caribbean which if you sneezed at the wrong time you’d miss as you flew over it, lacks the resources to have full blown sugar cane plantations on the available land). Subsequent digging suggests that the Pyrat brand is actually owned by a Nevada outfit called the Patron Spirits Company, and they have a line of spirits products that extends from Patron tequila, to Ultimat vodka, to liqueurs, and rums. So do they own the Anguilla company? Don’t know…probably they are acting as marketing and distribution agents for the factory, which, as Ed Hamilton of the Ministry of Rum notes, was shut down in 2010. Note that the rum is now made from DDL’s rum stock from Guyana, and given the shutdown in Anguilla, it’s very likely that the blending takes place in Guyana as well (I was not able to definitely confirm this beyond the anecdotal, but Arctic told me they definitely bottle it there, so it seems reasonable). Be that as it may, I must commend them for the mere look of the package. I’m a sucker for a good presentation; it’s part of the overall aesthetic, I argue, much to the disgust of the various maltsters of my acquaintance, who refuse to be sidetracked by such mundane matters and make no bones about chucking wrapper, box and bunting as soon as they buy a bottle of anything. Here, Pyrat’s delivers, and this is as it should be for a self-annointed “ultra-premium” rum costing north of two hundred bucks. The hand blown bottle is encased in a wooden box (the Pyrat homepage says cedar, but I notice one reviewer says walnut, and from the lack of an aroma, walnut is my take also), and around its neck is a medallion with the patron saint of fortune tellers and bartenders, Hoti. And there’s a hand lettered label signed by the master blender. Pretty cool. 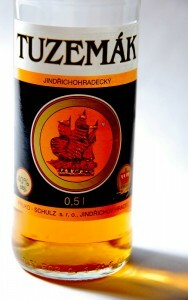 The rum is a dark amber colour, and has a heavy look to it. The cork is a real cork, no extras or plastic anything. And as soon as I opened the stopper, I knew I’d been had. Well, perhaps not – perhaps I’d allowed myself to be had in my eagerness to try something new at the supposed top end of the scale. The nose wafted out and it was immediately clear that customers of the XO had written in and started a campaign to assure Pyrat’s that the citrus they had sensed in the XO — the very thing I had disliked so much about it – was for wussies and they demanded something with just as much or more orange heft: and Pyrat’s complied. Open the botle and the waft of an orange grove comes right at you. There’s a sullen, sulky heaviness to it when it pours into your glass that reminds you of a lighter-coloured El Dorado – and the legs were relatively slow and fat as they slid down the sides, so that part was good. But nosing it was about as subtle as the grapefruit scene with Mae Clark in 1931’s “Public Enemy”. Yes, I got vanilla (and I had to strain for that); yes there were subtler hints of cherries and flowers here (more strain), under which moved the darker scent of burnt brown sugar – but there was nothing overly dramatic that grabbed my snoot, no I-see-Vishnu moment, no heavenly chorus of angel who should attend the opening of such a purportedly premium product. What was self evident was, as I’ve noted, that damned scent. The citrus background was more muted than in the XO, but still far too prevalent and bashed the others into a sort of torpid insensibility – it’s like an orange Chuck Norris came through the joint, belted out a roundhouse kick to the face, and all the other smells fell down, twitching feebly. The palate? No redemption, I’m afraid, and by now I was wondering – what the hell was going on? Did some disgruntled vet pop a few hundred rinds into the still? 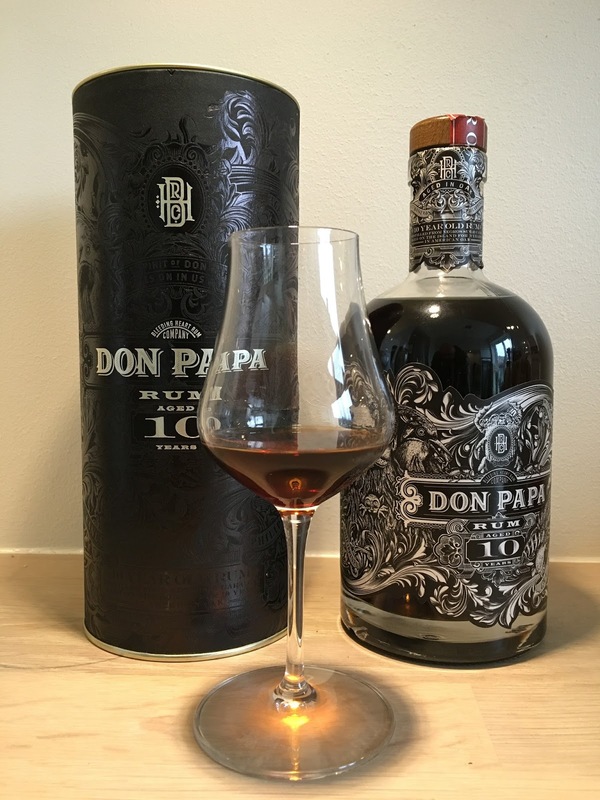 The liquid was thicker and oilier than other rums I’ve tried, and coated the tongue like it wanted to be a delivery system for a few fascinating flavours the master blender had pulled out of his hat; there was a sweet and lasting flavor, but what the hell was it? A liqueur? I was tasting a smoothly sweetish spirit and a commingled taste of various almost impossible-to-discern elements dominated by orange marmalade flavor. Again I got the annoyingly faint background tastes the nose had hinted at, without any of them having the courage to tek front and show us who was boss. The floral scents dimmed more than shimmered, the caramel-molasses and burnt sugar taste faded almost entirely, and what I was left with was something that wasn’t sure what it wanted to be…too sweet for a rum, not complex enough for a high-end. Excuse me fellas. I thought there was supposed to be rums here. This was what two hundred drops of my sweat had bought? And don’t believe I was entirely mollified by the excellent fade, the only thing I don’t have a whinge about. The 1623 goes down very well, without serious burn or scratch, and even a non-rum-drinker might like that part: my 72 year old father-in-law took a sniff, smacked his gums, sipped it down and allowed it may even eclipse the standard Russian rotgut he preferred (talk about damning with faint praise there), while observing it had too much sugar, as if I should shoot off to Anguilla immediately and take them to task about the matter. In fact, I did send an email down there (and to Patron) asking about the taste and the sugar, which has thus far remained unanswered. Pyrat’s Cask 1623, also known as Cask 23 for people who can’t be bothered to write the whole thing, is a blend of rums aged up to 40 years. 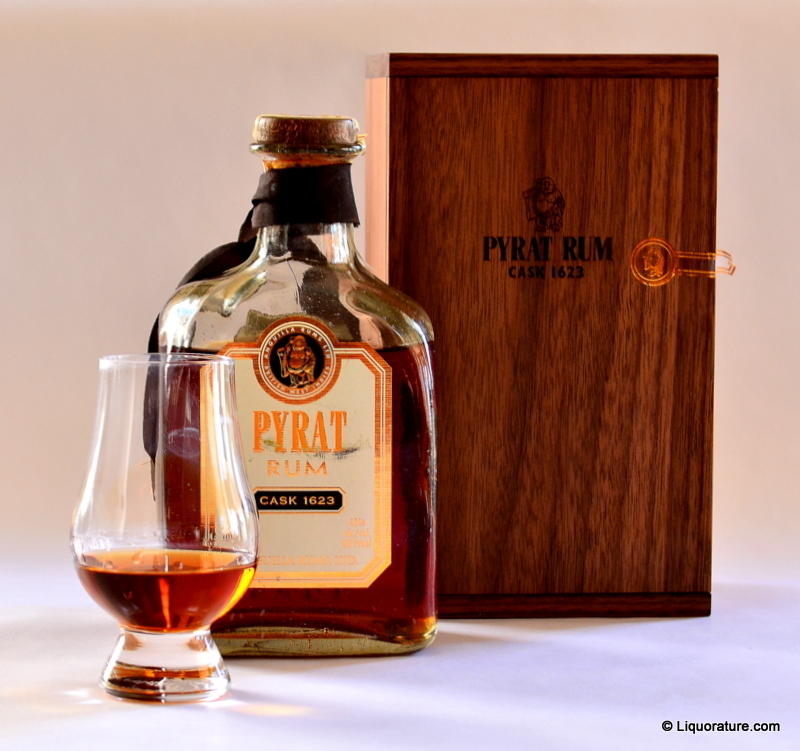 Note the careful phrasing on the Pyrat website: “We distill the dark amber spirit in limited quantities, ageing its smooth distinctive blend of premium Caribbean rums in oak barrels for up to 40 years.” What that means to me is that the oldest rum in the blend is 40 years old (not the youngest) and there’s no information regarding what proportion is that old. About all I’ve read online is that the average age of the blends of pot-still and column-still rums that make the 1623, is 23 years. Even the barrels are a bit dodgy – I’ve heard of the usual bourbon barrels, of course, and rumours of barrels that once held orange liqueur. So maybe that’s what it is. Caveat Emptor. 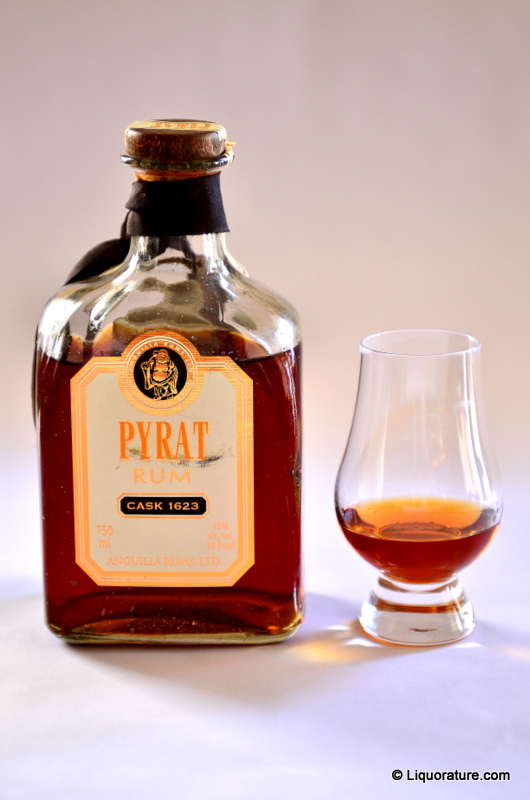 Honesty compels me to note that Pyrat’s 1623 won the 2007 Ministry of Rum tasting competition, but speaking for this puppy, I can only wonder how on earth that happened. Let me put it to you this way: if you were handing out prizes for distinctiveness, then Bundie, Old Port, Pyrat’s XO and maybe Legendario would come out top – you could taste them blind and know what you were getting because they are so unique in taste, so different: but that difference does not translate into real quality, and frankly, I think Pyrat’s is teetering on the edge of not being a rum at all, what with all that extra stuff they must be chucking into the ageing barrels with such languid insouciance. So there we have it. Unimpressive. I know I sound a little miffed, perhaps even a shade snarky. But I’m feeling let down, more than a little annoyed. Actually, I’m plenty mad. This rum is such a disappointment – it’s a forty dollar rum in a hundred dollar package, selling for two hundred. Some might argue that I like the sugar-caramel-molasses taste in my rums, and just as I like that taste, so there are others out there who prefer peats, and others who will like orange or sherry or what have you. No harm no foul. Yet, I disagree: the whole selling point of Islay whiskies is that unmistakeable peatiness; with rums it’s the core of caramel and burnt sugar enhanced by the varying notes imparted by climate (Bundie or Old Port spring to mind immediately), distillation techniques, ageing and the barrels used. In the top end of rums, there is an underlying harmony, a sort of zen marriage of all good things that come together like a Porsche 911 GT3. Sure it blasts off with you, but in a good way. All is in balance. You don’t mind getting your faced ripped off at 6500 rpm and 200mph because you are utterly ensorcelled by the sheer unbridled harmony of the components meshing together like they were lubricated in distilled angels’ tears. And that’s not the case here. We’ve been sold on a marketing gimmick. We’ve been fed on rarity, a carefully parsed age statement, and price (and a really odd dearth of online reviews I have difficulty comprehending – what, has no-one tasted this thing?). When I tried the English Harbour 1981, the Appleton 30 and Master’s Blend, the El Dorado 21 and 25, the G&M Longpond 1941, I could taste the underlying structural complexity and efforts to both smoothen and balance off the competing flavours. Here, we have an inexplicable central taste of citrus that advertises its ego from the get go, practically drowns out all other flavours, and to my mind is only marginally redeemed by an extraordinary smoothness. Ultra-premium? Yeah, it’s about as ultra-premium as a garage sale with one good item in it. For a rum this expensive and positioning itself at the top of the rum chain, I’d suggest that they stop messing about with the Hoti medallion…and replace it with one that bears the imprint of the patron saint of shell games and snake oil sellers. A homunculus of a rum, this – it’s got all the hallmarks of a rum – the background taste, the nose, a bit of bite; but at end, you’ll either think it’s a strong liqueur or a weak rum, and in either case it works better as a dessert drink than a true sipper in your glass. “Bloody mouthwash!” my esteemed and geriatric sire sneered years and years ago, as I sipped a Crème de Menthe in the days when I was still searching for a drink to call my own and clutch to my post-pubescent chest. I fear that since his tongue is the only instrument I know which gets sharper with constant use, he would take one shot of the Juan Santos café 34% and bugle “Nescafe!” with that same note of relish at having won an obscure point (I will note he is a rabid aficionado of the El Dorado 15, which he says he can barely afford, even as he counts his many properties and makes jokes – admittedly very funny – about my lack of an inheritance…but I digress). 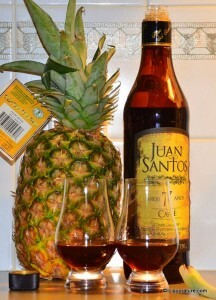 So what to make of Juan Santos’s entry into the flavoured undeproof rum segment? And yet, like many small things, the baby rum is pretty good if you’re prepared to take it on its own terms. You open it, and because of the lower alcohol content, you don’t get the spear of spirit skewering you right off. It presents with a smooth, soft nose, a bit like Irish coffee, really. Coffee – for which Columbia is justly famed – is right in the middle, with caramel butterscotch undertones, and the alcohol lending it the slightest bit of heft. On that level, it works swimmingly. On the tongue, the lack of alcohol bite works entirely to your advantage, because it gives you a chance not to wince, and merely appreciate the flavours: and those flavours are some dark sugar, some currants and berries, perhaps a nut of some kind and an overwhelming taste of coffee. It’s sweet, very sweet, more like a liqueur than a real rum, light and a bit creamy. Delicious, truly. On the flip side, that taste – while nowhere near as unpleasant as the orange of the Pyrat’s XO was to me – will be the second deciding factor in making you decide whether you like it or not (the other being the sub-par strength). 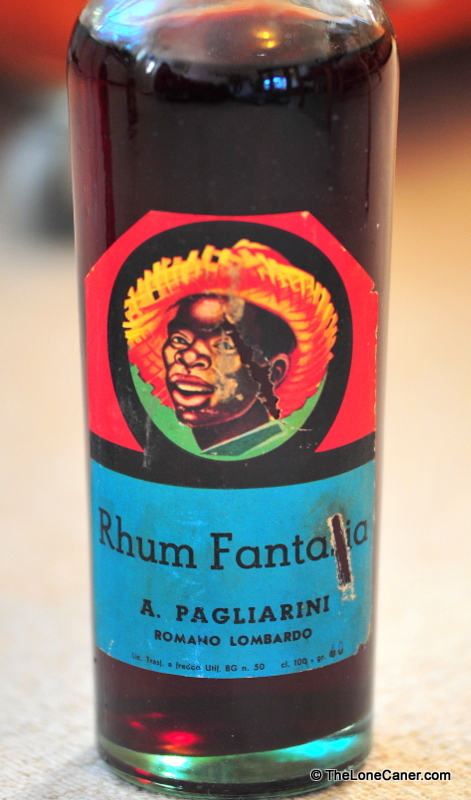 So here is where I add the caveats: as long as you’re prepared to accept that this is a rumlet, not a “real” rum (in the sense that it is weaker than the standard 40% just about everyone is used to); as long as you really do have a sweet tooth; and as long as you don’t have a real rum nearby (like another Juan Santos) – so long as these things hold true, you’ll like this cafe infused variation. It’s these things that will make it work for some, not for others, since it is thicker and more sugary than any other rum I’ve ever tried, coats the tongue well and doesn’t so much sting as caress your taste buds. Not all will like that, and for me, having had it off and on for six months, I have to say it’s what Guyanese would call “sometimish.” Inconsistent, and not always serious. The finish, as we might expect from a weaker cousin of the older and brawnier relatives, is smooth, gentle and not in the slightest bit assertive. The thing about such underproofs is that they are meant to be had as after dinner, dessert likkers. If I wanted to go on a bender, there’s no way I’d touch an underproof (any of them). 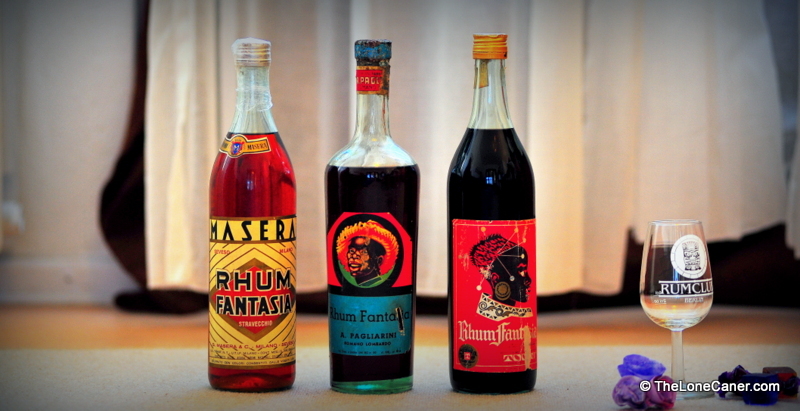 I started this review by suggesting I’m not really a fan of liqueurs or underproofs. I still feel that way. I won’t open the Café variation too often. But it’s more a question of when and where than of what. No, I won’t drink it often, but I will open it on a cool evening when I’m out on the veranda after a good meal, when something standard-strong won’t cut it, and a nice, soft after-dinner rum that soothes instead of bites is called for. Something not as thick as Bailey’s. A variation on an Irish coffee, maybe. Something that complements and completes the meal, that my wife can share and enjoy while next to me, and which I can take pleasure in as the city goes quiet, night falls and the breezes blow and we talk of nothing in particular. Something, in point of fact, exactly like the Juan Santos. 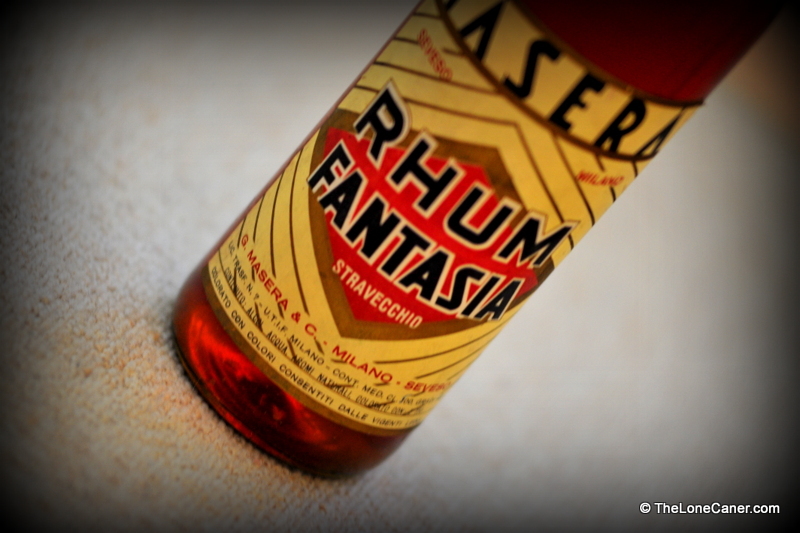 Short version – too much orange peel and marmalade flavours mar an otherwise reasonable rum. It may sound sacrilegious to even mention this 15 year old product of Anguilla in the same breath as Bundie, but when you think about it, Bundaberg is without question one of the unique rums in the world: one may despise it and spit after mentioning its name, but there’s no denying it stays with you. It’s like the dark reflection of the EH25. And Pyrat (pronounced “pirate”) is another one like that which, love it or hate it, will not soon be forgotten. While made in Anguilla, it isbended and bottled at DDL’s facilities in Guyana, and then imported to North America by a company out of Nevada (I don’t know whether the Nevada company owns or has shares in the producer). It has a squat, bottom heavy bottle reminiscent of the old pirate bottles (embedded in our mental imagery of the world by what must be a thousand movies), and an amber, clear colour verging on the orange. It is a blend of different 15-year-old rums aged in used whiskey or bourbon barrels, and bottled at 40% strength. I must concede Pyrat’s is a pretty unique middle-end rum, although cheaper than one would expect for a 15-year old (~$40). The first thing that hits you after you remove the cork is the citrus nose. Yes there’s sugar and vanilla and caramel notes in there too, but they are almost clobbered into insensibility by the attack of the orange marmalade and citrus peel flavouring (and to some extent, by the spirit as well – this has a sharp bouquet). The taste is similar: a little harsh, mid-level burn, medium finish…and those orangey notes just keep on going forever. It’s like you are drinking a liquid orange bathed in burnt sugar, with just enough whiskey aftertaste to stop this from being classed as a liqueur (it’s a close run thing, however). Very, very distinctive: like the Bundie, you could taste this blind and know exactly what it is. Did I like it? Texture, yes, taste, not at all. It conflicted a little with my sense of what a rum should taste like – I was startled by how intense the orange was – but it was smooth enough and mellow enough for me to appreciate it more as the evening wore on. The flavour sort of darkened over the hours and became heavier, which I sort of enjoyed. That said, I’m not entirely sure this as good as it could have been for the kind of ageing it has undergone: the Venezuelan Diplomatica Exclusiva Reserva was a lot better for about the same price. I must concede that as a mixer (3:1 in favour of the Pyrat’s) this lights up a coke like the 1st of July, and is even better when one adds a lime wedge, so all is not lost. But maybe the Last Hippe has had the last laugh after all: because I’ve been spoiled to think of 10-year-olds and better as sippers, the way whiskeys are. And when older rums like this one fall just short of the mark, then unique or not, I must simply state that my preference is not always for the uniqueness of taste or flavour, or even the superlativeness of the texture and feel on the tongue, but on the relative ranking of this baby to other fifteen year olds I like. And there, while I appreciate Pyrat’s as a crazy unique drink in a class all its own, I must say it’ll never entirely be one of my favourites (all other pundits to the contrary). 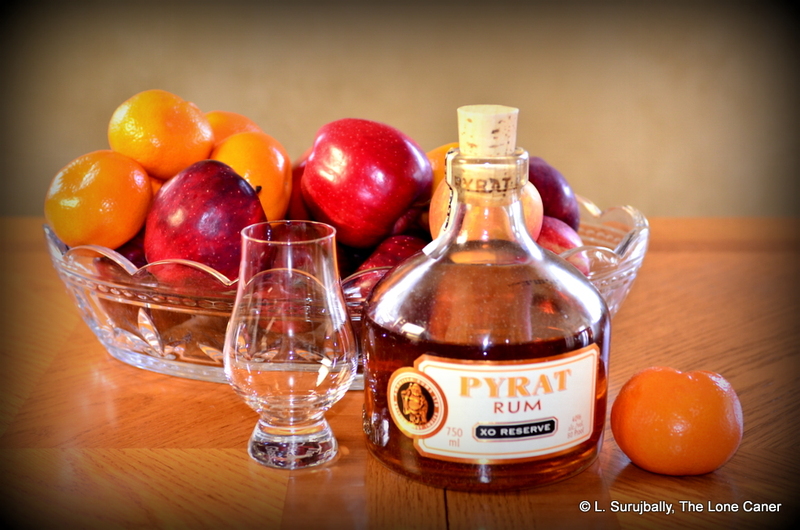 A last note: I heard that sometime in the last few years Pyrat’s changed the blending to enhance the citrus, and prior blends were darker, sweeter and smokier. That being the case, I might have to take one of the older variants to see whether the changes were an improvement or not. 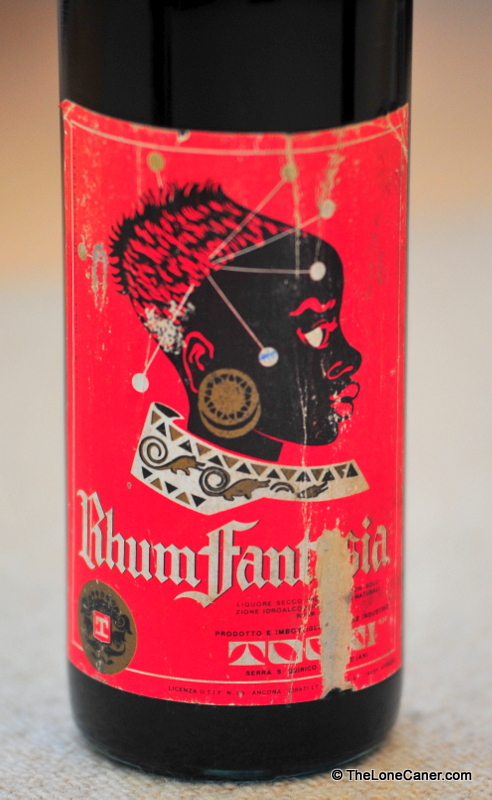 Note also that this rum is now bottled, and maybe even made, in Guyana, at DDL’s facilities. A post went up n Facebook recently that supplied a photograph of the new label. Here at last the statement is more honest, calling it a spirit which is a blend of rums and “natural flavours.” So it’s a spiced spirit now, and not really a true rum. Disregard the word “artisanal”. 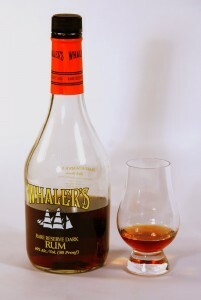 Whaler’s Rare Dark Reserve Rum is all characteristics and no character: smell without nose, burn without body and aggressiveness bordering on the obnoxious without actually delivering on any of the promises it makes. Don’t let the tempting scent fool you. That’s most of what you’re gonna be getting. 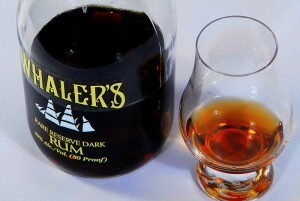 Whaler’s Rare Reserve Dark rum is not, as its advertising might imply, made in Hawaii. Its website certainly suggests the connection by touting the traditional recipe used by whalers in the old days, copied from native islanders’ own rum production on Maui and perhaps infused with vanilla beans once used to rattle around in bottles, meant to entice whales to come closer. An amusing tale which may even be true. Be that as it may, the rum takes its name from the hardy sailors who once plied the Pacific searching for the whales to decimate and made rum on the side when stopping for R&R in the islands. For a bottle costing less than $25, you can’t expect too much, and indeed, it doesn’t deliver too much. In that sense, it is not like the Tanduay, an undiscovered steal: it’s just a low level adulterated rum made from neutral spirits. What makes it stand out from the crowd is a nose of real, if simple, power. Open this bottle and just let it stand there: it’s like somebody let off a butterscotch bomb in the room (and lest you think I’m exaggerating, I tasted this with a group of Scotiabank employees, and one of them smelled it twenty feet away in less than threee seconds…before I poured a single glass). I have gradually been corrupted into using a glencairn glass, but truth is, you don’t need something snooty for Whaler’s – what you really need is a gas mask to filter the thing out. The darkness of Whaler’s is, I concede, appealing, and it sports a medium body (I expected something heavier and richer from that colour, but no…). In the glass it sports thin legs, and that is where this kind of test proves its worth. Consider: a strong, overpowering nose of butterscotch and vanilla through which you can dimly and imperfectly sense caramel and some sugar and pretty much nothing else. A body that stings and burns and delivers that taste…and nothing else. A finish that is short and thin and stings (not much, but that’s me damning it with faint praise)…and nothing else. I’ve heard and read of rum lovers discussing “hollow” rums, which have all promise and no delivery – this is the first one I’ve ever tried. What Whalers really is, when all is said and done and drunk, is a flavoured, spiced rum. Not even fancy herbal stuff like, oh, the Tuzemak, or even Captain Morgan – those two have the balls to put their money where their advertisements are and don’t have airy pretensions to more than that – but just a bucketload of caramel, vanilla and butterscotch flavouring poured into some 40% rum. As a low level mixer this will be okay, I guess. As a sipper it fails, utterly, unless you’re after a harsh liqueur of some kind, or a cocktail base. I know I’m not, but if you are, I’d suggest a coke zero or some other non-sweet mixer: this thing is too sugary by half already and doesn’t need any further embellishment. Heaven Hill distillery from Bardstown, Kentucky may be the harbinger of an accelerating trend: that of larger distillers diversifying their entire portfolios and producing more than just the spirits that once made their name. Bacardi has stuck with rums (and has one at every price point except the stratosphere) as has J. Wray & Nephew, but research I’ve done on Tanduay, Banks DIH, DDL and of course Diageo shows that these big guns (among others) are producing vodkas, tequilas, gins, whiskies, liqueurs and just about everything else north of 30% ABV. Even Bruichladdich and Cadenhead are now experimenting with rums as opposed to straight whisky production. And here is the Whaler’s Distilling Company, a subsidiary of Heaven Hill, producing rums in Bourbon country. In fairness, that’s the way companies survive, by innovation and adaptation to a marketplace where drinking preferences are all over the map and changing in a heartbeat at the dictates of fashion; quality control is better and modern technologies are consistently employed for a taste that is the same bottle to bottle: none of that hit and miss approach that characterizes tiny operations making rum for local consumption on small islands. But I still kind of regret the passage from the uniqueness of such tightly focused distilleries to something more impersonal. First posted 26 November 2010 on Liquorature. Herbal, different and like few other rums (we’ll be generous with the term) ever made; will add variety to cocktails and cheer to any Czechs you booze with, but my take is to exercise care when you have it neat. 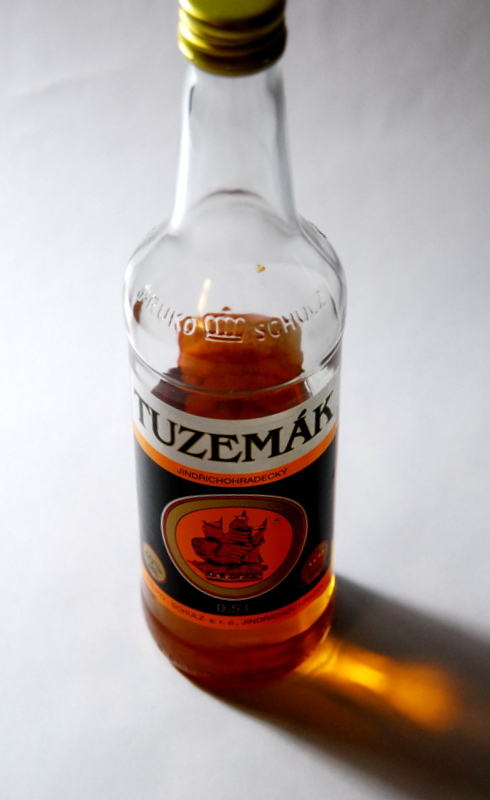 We must establish from the outset that all labeling to the contrary, Tuzemak is not a rum. This is because it is made from potatoes (some travel bloggers and websites say beets, so I’m still trying to find out which), not sugar cane, and while you might find it in the rum section, it’s simply because the Czech manufacturers have in the past included colouring and taste additives to make it more like a real rum, and called it as such. I’m no fan of over-regulation, and the EU has whole warehouses crammed floor to ceiling with them, but in this case their ruling that to be classified and sold as rum in Europe, the thing can’t be made from pommes-de-terre, finds much favor with me. Which is not to say I actually despise the drink I bought on a whim at willow Park the other day (my curiosity and nosiness will be the undoing of me one day, I fear). As a confirmed internationalist and pretender to cosmopolitanism, I try to take a more tolerant view of differences, and if this thing more or less looks like a brown drink, tastes sweeter than whisky and smells a bit like the good stuff, while being trumpeted as a rum in Czechoslovakia even though they have been forbidden to do so…well, I’m not averse to taking it at face value (The Last Hippie, who refuses to concede that there is any other whisky than the Scotch kind even as he snootily reviews what he terms “lesser offerings” in an effort to call himself fair, would probably be horrified at my laissez-faire attitude, but them’s the breaks). Enough temporizing, then: what’s the story on the rum? On the nose, it’s not too shabby. It’s a little pungent, a shade sharp, but as it settles, wafts of vanilla billow gently into your nose without too much sting or burn. There is a very slight medicinal undertone that kind of spoils the taste, but not so much as to seriously detract from the overall quality, just to show it’s not an aged product. What kind of blend it is – that is to say, what’s in it or how many differing ingredients there are – I cannot say. There’s too little information available. In summary, I think this is a very workmanlike entry to the genre. I’d drink it neat, yes; but it makes a phenomenally different and pleasurable mixer too, largely due to its unusual herbal properties which give even that old faithful, the rum and coke, a uniquely different perspective. Remember how I despised the plasticine taste of the Stroh 54? This delectable local tipple from middle Europe avoids the pitfalls of that overproof, and is a decent rum, an interesting sipping tipple and something that I’d recommend for any who want to try something a little off the reservation.